Hair Beauty is a dedicated theme for Hair Salons and Barbershops, stylist websites and makeup studios. Theme design is specially adapted to suit any hair salon needs – you can display your barbers and hairdressers profiles, hair beauty photos in portfolio, list services your beauty salon provides. Custom Admin panel – we have greatly extended initial WordPress admin to provide you with more functionality that includes a wide variety of options and settings and provides maximum customization flexibility to help you create a barbershop and hair salon website – Hair Beauty WordPress Theme is for you! Custom Form Builder Tool – Cmsmasters team has created a custom form builder tool that lets you create forms of different types, like beauty surveys, hair stylist questionnaires, haircut and hairdo signup forms, etc. Responsive Layout – Hair Beauty barbershop and hair salon theme has a responsive layout that will respond to your screen width and make content appearance be perfect on all devices, from large desktop screens to mobile phones and tablets. Advanced SEO for Wordpress – this theme for beauty salons and barbersops has an optimized code and structure, as well as fantastic Custom SEO options for every page and posts, allowing you to easily add important SEO meta data to all your website content. 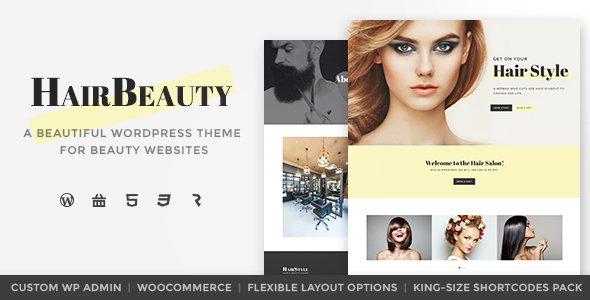 If you are creating a hair salon website, a barbershop of tattoo salon website, a hair stylist blog or any other beauty blog – Hair Beauty WP Theme is for you.